Two weeks ago I had the privilege of spending a few days with many of my LMI colleagues from around the world at our annual convention in Florence. Our flight from London went into Pisa so, having never set foot in Italy before, it would have been rude not to stop and have a look around. As every good tourist does in that small-ish Italian town, we headed in what seemed like the direction of that world-famous wonky tower. It’s more wonky that I thought! You can’t see the tower from miles away so it came as quite a shock when we rounded a corner and there it was, leaning away, just like in the pictures. Having seen it’s picture dozens of times, I was still amazed, when confronted with it in real life, at just how much it leans. It’s impressive! Something I then found very interesting. The closer I got to it, the less obvious it’s lean became. It’s basic physics I know, but these things make an impact when you experience them first hand. Close up, it could almost be straight. Start walking away and look back, it’s lean becomes stark once again. Lots in our lives and our businesses can be like this. We get so involved, so consumed by the the day-to-day demands, so ‘close’ to all that’s going on, we don’t notice how wonky it is. When I look at the pictures I’m reminded to step back and notice where things may have become a little wonky. Am I working too many hours & have lost balance? Have I stopped being so careful about prioritising my work? Are my goals a little out of focus? Has our passion for great customer service dropped off a little? Whatever ‘stepping back’ means for you at the moment, it’s well worth doing. And when you notice something’s wonky, get help to fix it (unless it’s so extraordinary that you can get rich off people coming to see it)! Getting your work done 2 hours quicker! I was walking Eden, my ten year old daughter, to school this morning half an hour ahead of the rest of the family because of an 8.15am extra maths session. Was this a punishment? A chore? A drag-your-feet, wish-you-weren’t-there experience? Nope – the absolute opposite. Eden was bouncing along the road, and had been bouncing round the house for at least an hour before we left. 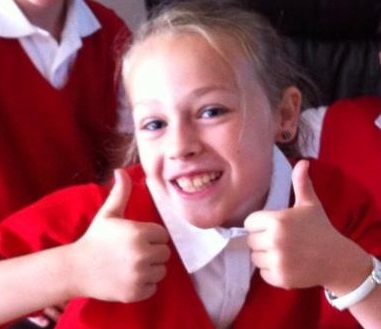 She was excited….about extra maths! What makes this really interesting for me, and worthy of a blog, is that just a few weeks ago she was ‘rubbish at maths’ and regularly told us how much she disliked it. When it came to maths homework, motivation was seriously low. Then it changed, literally overnight. One day at school there came a Maths test in an area that she was ok at. She did well. She felt good. The teacher praised her. She felt encouraged. She liked that feeling and she set a goal to go one mark better (out of 20) next time. So she worked at her homework and achieved her goal. Suddenly, she loves maths, is doing loads better at it, motivation is sky high and her attitude has been transformed. This morning’s early start was for a special invitation maths club for the super-keen! Proud parental gushing aside (sorry about that! ), this is such a lesson in how attitudes, motivation and results can be similarly transformed. Set yourself and others up for some small success, celebrate that success, set another goal. Achieve that goal…and so on. Sounds over-simplistic I know, but it works. Sometimes it takes longer to see drastic change, but sometimes there really is an immediate impact. Either way, set goals, celebrate every small success and keep on going! Much more than time management. FOUNDATIONS OF SUCCESS is a free monthly workshop for business owners, leaders and managers, as well as HR / L&D professionals interested in business performance improvement through developing people. These two-hour events serve as an introduction to the concepts and practical tools that LMI have been using all over the world for more than 50 years in support of personal and organisational development for our clients – from sole traders and SMEs through to some of the world’s largest and best-known companies. Edinburgh & back before tea time! I’m writing this in an Edinburgh cafe having left home in Coventry this morning. I shall be home by tea time! In an hour’s time I’ll be meeting with an LMI course graduate, their line manager and a representative from the company’s L&D department to review the results from the programme and hear the course-end presentation. It’s an important trip and well worth my time today as part of a great ongoing relationship with an important national client. It has, however, got me thinking. Just because I can get to almost anywhere before breakfast, doesn’t mean that I should! For everything we do, there is not just the cost of doing it, but also the opportunity cost of NOT DOING something else. So whilst this trip is absolutely worthwhile, there are some others that I used to make that aren’t. It’s probably the same for you. For example, for the ‘cost’ of a trip to a site one hour away, I could do the same work with two companies on my doorstep. It may be that the meeting is important, but you could save a lot of time by doing it over the web. I’m a huge fan of Vsee (bit like Skype but more functionality & better quality) for business meetings. There are dozens of other ways to maximise your time. You are currently browsing the archives for the LMI category.